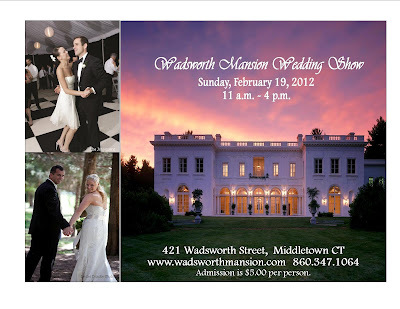 Wadsworth Mansion Blog: Wadsworth Mansion Wedding Show - This Sunday - February 19th! Wadsworth Mansion Wedding Show - This Sunday - February 19th! We had so much fun at last year's Wedding Show and we are so excited to see what this year brings! This annual event features a fantastic selection of products and services necessary for planning the perfect wedding. See the latest bouquets, centerpieces, and bridesmaid dresses, and sample delicious appetizers and signature cocktails. Wadsworth Mansion staff and other top wedding professionals will be on hand to answer your questions about the big event. Admission is $5.00 per person. Wadsworth Mansion Brides and Grooms receive free admission. Click here for more information and a list of participating vendors! E-mail us to reserve your spot today!